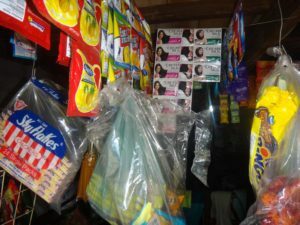 One way people make a living is to run a sari-sari store. I don’t know how universal that term is, but locally it is the term for the neighborhood convenience store. I have seen them from as small as a closet to the size of a small room in the local area. You walk up to the window and order your needs. 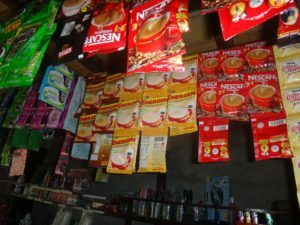 It might be rice in just a small enough size for one meal, I have seen single cigarettes, single serving packets of shampoo, single cup packets of coffee etc. From what I have observed it is most often due to the fact that the single meal bag of rice is all that they can afford. Certainly it is also a stopgap measure for someone that has run out of an item and is needing something before the next trip to the market. Inday, the lady that runs things at the children’s home is unpaid for her services but her and Babeselle live in the house rent free. It gives them a place to live as well as helps us so that squatters don’t move in. The way things work, if that happened it could take some time to get squatters evicted. 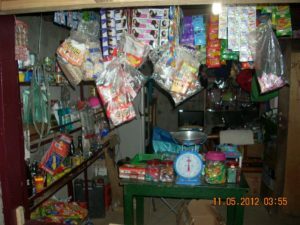 She runs a sari-sari store out of the one window of the home. In the pictures you can see that she has packaged rice from the large bag she purchased into small long plastic bags. This is not a get rich quick business as she generally makes only 5-10 cents per sale at the most. However, most of the time it helps cover the expenses of her and her daughter. She also does laundry for other people and Babeselle is proud that she can help with earning that money with her mother. Here in Indiana, in South Bend, there is a store run by Philippine people that is named the Sari-Sari store. It is a much more typical store for the States but it has a lot of items from “home”. 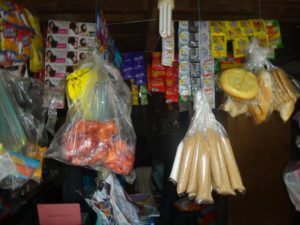 Next time you stop at a convenience store, you can remember the sari-sari stores.